Reinbek bei Hamburg: Rowohlt Taschenbuch Verlag, 1991. 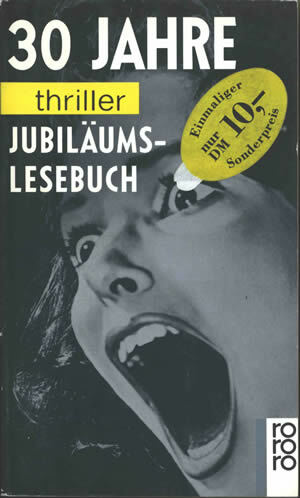 This volume of short fiction was released by Rowohlt Taschenbuch Verlag to celebrate the 30-year anniversary of their "rororo thriller" series. It contains the short story "Chee's Witch" by Tony Hillerman, beginning on page 107. The story, according to Tony Hillerman, was an experiment with certain plot elements. He states, "Readers of my books may notice that one of these ideas later became an important part of The Dark Wind and the other the key to The Ghostway." This is a paperback volume with two-color paper covers. Binding: Two-color paper covers. On the spine, the volume title is printed in white on black, horizontally, top to bottom.